Our New prairie Team Members hard at work! We are a employee-centric company with an emphasis on teamwork. We work hard and enjoy spending time relaxing too! The whole New Prairie Construction Team! Kalin and Steve Blout from CivicSolar stand in front of a ground-mounted solar array installed in 2017. Solar makes Nicholas and Nicole smile! Quinn takes a break on a big bag of air! Nick wires up an optimizer. Jill and Waheed do the roof layout. Helping each other is key! Steffon, Jill, and Nicole work on the roof together. Steffon and Nicole are extra careful as they move on the roof. Nick, Quinn, and Waheed talk over layout. Dan works on wiring up the system. A wonderful place to spend an afternoon. 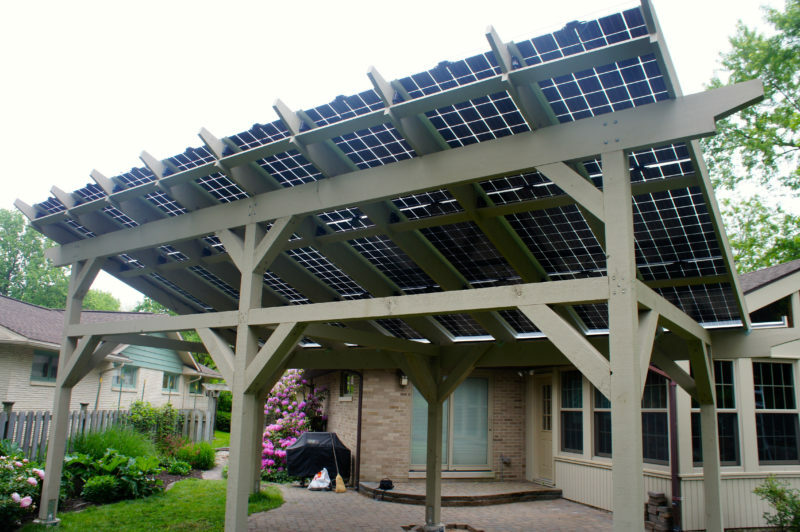 A 7.6 kW solar array graces this newly-built backyard pergola in Champaign. 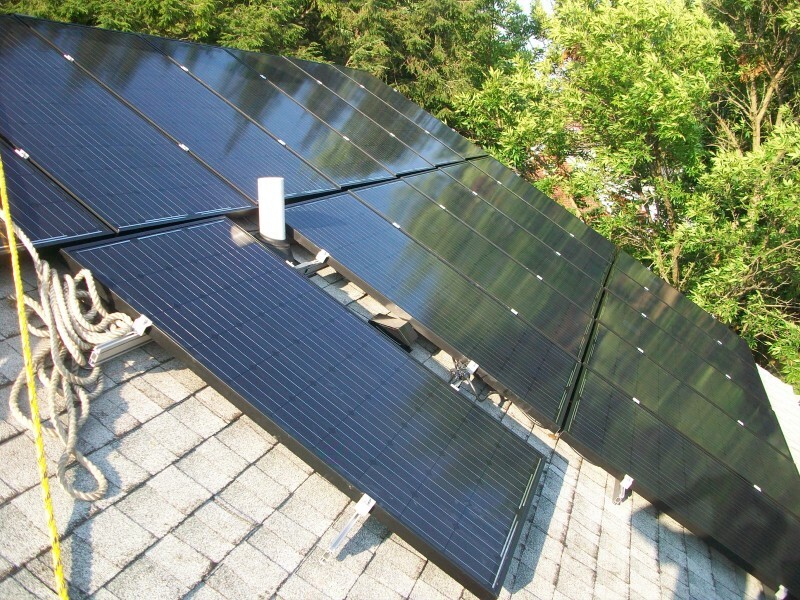 The homeowners are very committed to renewable energy and also have a geothermal system. 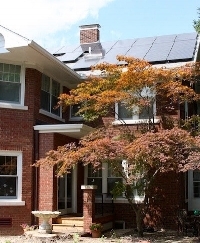 The owners of this 1929 colonial-style home in Champaign have gradually made it zero net energy, which means it produces at least as much energy as it consumes. This was accomplished through air-sealing and insulating, efficient appliances and lighting, a geothermal system, solar panels, and an electric vehicle. Some of the New Prairie Crew with Prof. Scott Willenbrock on the hottest day of the year! A 19th-century barn meets 21st-century technology in this solar panel installation in East Central Illinois. 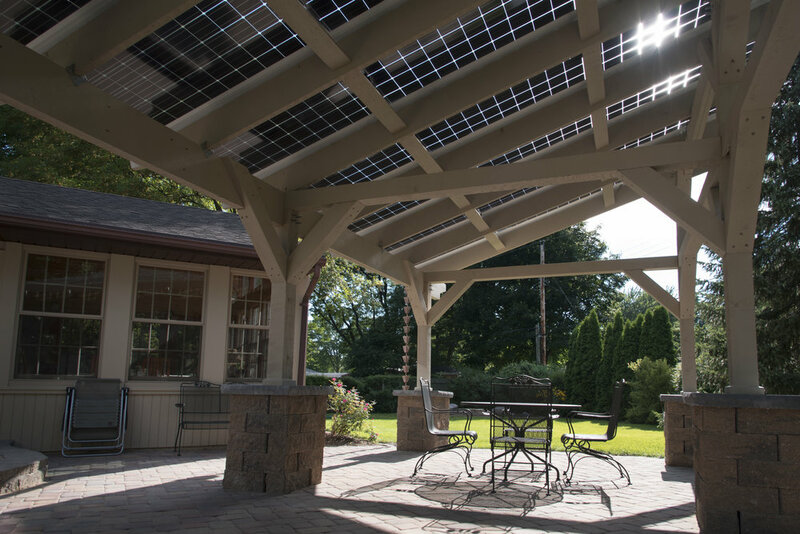 Barn roofs are an ideal place for solar panels, as they are rarely shaded by trees or other buildings, and can get full value from the solar array. 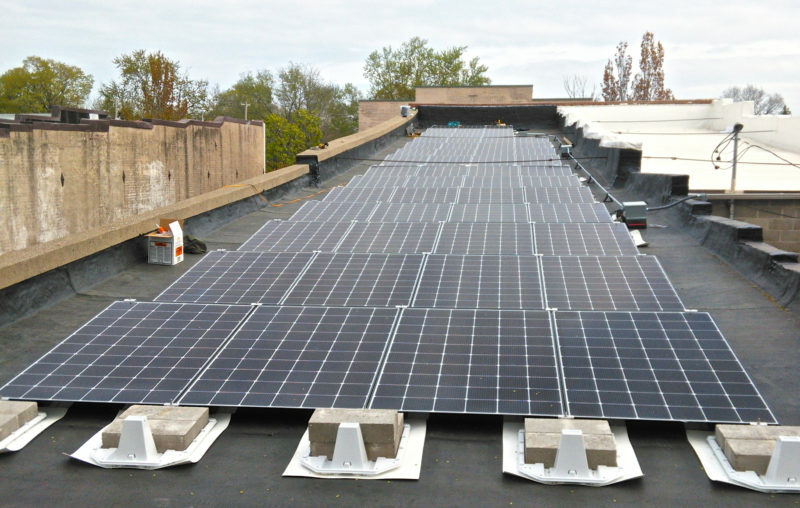 New Prairie replaced the roof and did some air-sealing on this old commercial building in Mahomet before partnering with StraightUp Solar to install the 16.95 kW solar photovoltaic system on the roof. Because you don’t want to poke holes in a flat rubber roof, this is a ballasted system — preformed recycled plastic pans with concrete blocks in them hold the racked panels down. 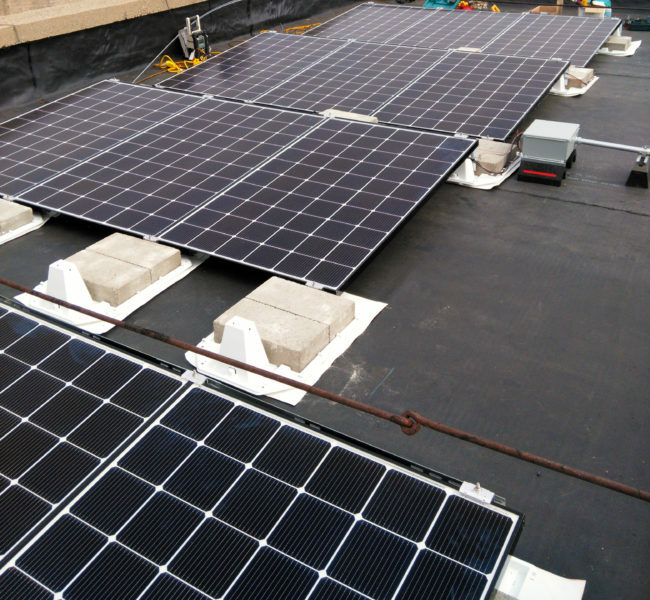 These arrays track the sun throughout the day to maximize power output. The modules come pallets like this to the site. The poles are set and braced before concrete is poured. 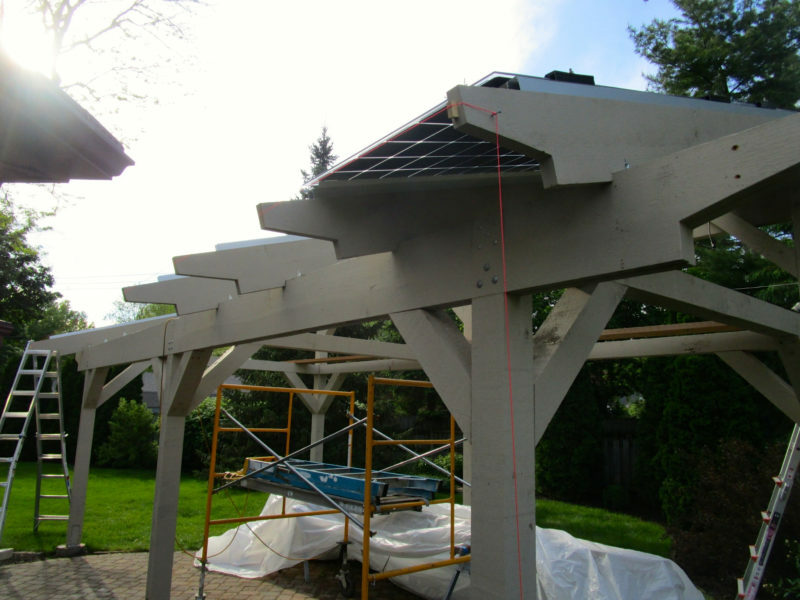 It is crucial that the poles are level and square, and that they will be able to support the load of the rotating solar panels. The ground is carefully trenched for the wiring conduit. The Homeowner’s look at the new concrete footers. These Homeowners were extra helpful, even giving an assist with their farm equipment! The tracker heads are lifted into place. The heads are mounted, and then wired up. A close up of more of the wiring before it’s all tucked away, we always make sure we manage our wiring so it’s as hidden as possible when we are finished. Dan assembles one of the tracker heads. We appreciated the assist with the very heavy steel poles! Waheed and Quinn assemble the module rails. The arrays start to come together! Dan works on cable management. Dan and Waheed work on cable management. Waheed does final touches on the arrays. We also built a custom frame for the inverter, meter, and required disconnect to be mounted on. In 2018 we installed a 9.6kW dual-axis tracking ground mounted solar system for a small family farm near Onarga, IL. 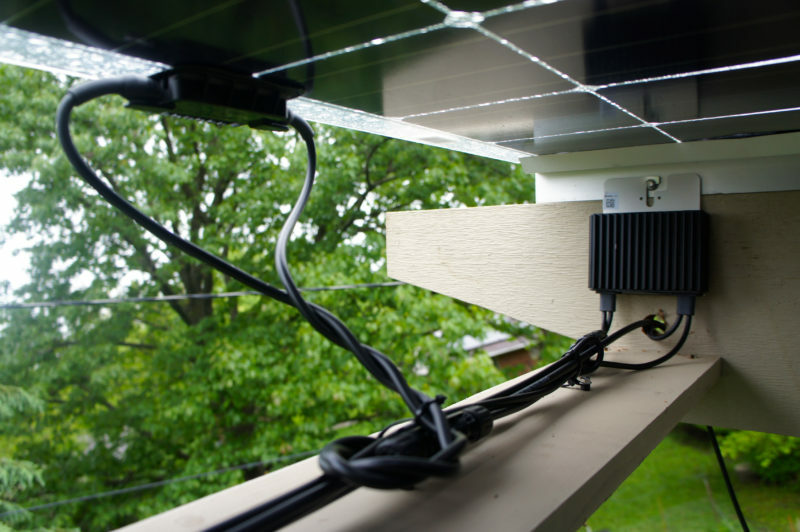 It uses Wattsun pole-mounted trackers, and bi-facial Sunpreme 4oo watt modules to increase production even more.